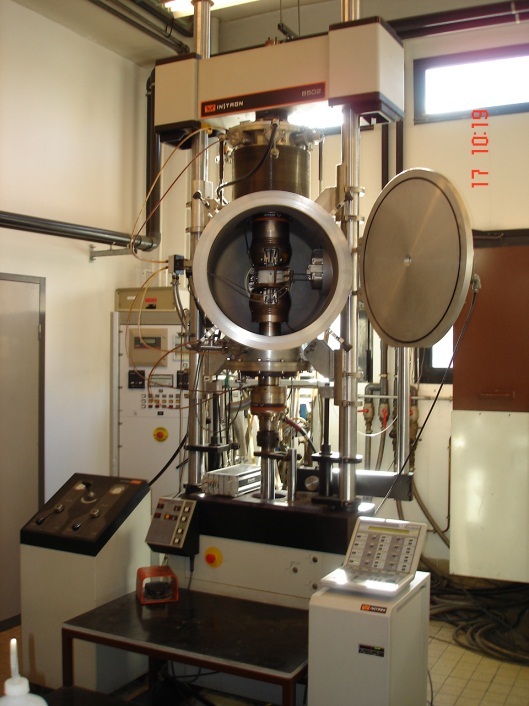 Here we have a uniaxial hydraulic mechanical testing machine equipped with an induction furnace and a high temperature capacitive extensometer. This installation allows us to carry out traction, creep and traction fatigue and/or compression tests at high temperatures in air-packed conditions up to 1600°C , vacuum-packed conditions up to 2000°C or in a neutral atmosphere. It is designed to carry out long terms tests immediately enabling us to study the mechanical behaviour and damage to ceramic matrix composites, thanks to us monitoring deformation during testing, as well as the associated life cycles. These tests are also instrumented in acoustic emissions in order to monitor and characterise damage during and post-testing (global analysis of acoustic activity and classification of AE signals) for different types of loading.